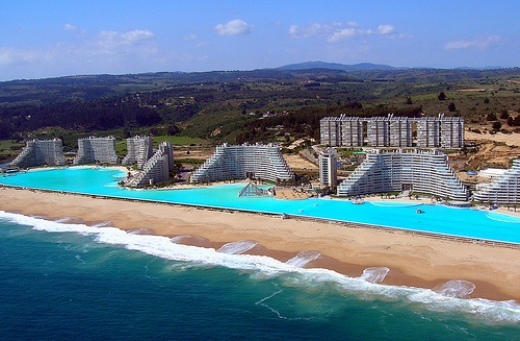 This is hands-down-in-a-dive the largest pool in the world (so says the Guinness Book of Records and they should know). At a staggering 3323 feet (1013 metres) in length, covering an area of eight hectares (20 acres) the pool is easily large enough to water-ski and parasail on - a mini ocean no less. One to five bedroom holiday apartments are available in the Mayan pyramid-style buildings that line the pool like a man-made mountain range. The pool even has 12 mini beaches and inlets ranged along its edge. Take a look at its Google earth image for a mind-blowing area view. The brainchild of Chilean real estate developer and biochemist Fernando Fischmann the pool is created by Crystal Lagoons with cutting edge technology that maintain the quality and clarity of 'massive volumes of water". You said it. As a general rule The Luxury Travel Bible doesn't like sharing its poolspace with several thousand other people but this one was so extraordinary we thought it deserved a mention.